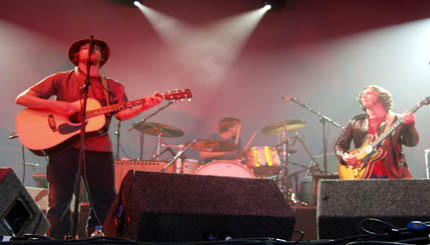 The Coral are an English band formed in 1996 in Hoylake on the Wirral Peninsula in Merseyside. The band's music is a mixture of old-fashioned country, 1960s-style psychedelia and folk-rock with modern alternative rock influences. The Coral have released 7 albums (The Coral, Magic and Medicine, Nightfreak and the Sons of Becker, The Invisible Invasion, Roots & Echoes, The Singles Collection/Magic & Mysteries, and Butterfly House). Their self-titled debut album was nominated for the 2002 Mercury Music Prize and later voted the fourth best album of the year by NME Magazine. It was announced on 9 January 2008 that Bill Ryder-Jones would be leaving, but the band would continue as a 5-piece.